This winter I ventured outside of loom knitting by first purchasing a cheap, plastic potholder loom and then, after a few disasterous attempts at making my own, a professionally-made 4" square loom from Hazel Rose. With the potholder loom, I made a potholder (gasp!) and also a scarf. With the Hazel Rose 4" multiloom, I made several squares with different yarns, but then became focused and made a hat from the 1936 Weave-It pattern book. I also made several dolls. Along the way, I discovered this cool, retro plastic loom in a thrift store, the 4" Wonder Weave! I liked it so much that my husband and I made a video, which is nearing 6,000 hits on Youtube. I know that isn't a huge number, but considering I didn't think it would have 100 hits, it's pretty remarkable. The idea of looms got me dreaming enough that my Christmas present was a 2' triloom from Hideaway Homestead. It's lovely, and it works like a charm. Within just a few days, I made a shawl! So, that all led into my new interest–flower looms. The first time I saw flower looms, I yawned and turned away. But then… I just became interested, all at once. Much to my surprise I realized I owned one–the small flower loom Knifty Knitter. (So that's why the pegs come out!) And then, while walking through an antique store yesterday, I saw this interesting little box marked Crazy Daisy Winder. It was $.10. Yes, that's ten cents… a dime. The small, round brass disc has a knob in the center that, when twisted, makes 12 tiny metal rods come out. Those little spikes hold your yarn/thread/metal while you wind on your "petals." Then, you secure the center with a series of clever stitches (the backstitch), and viola! You have a flower. A second twist of the knob, the metal spikes disappear, and the flower comes off the loom. Pretty nifty. From what I can find out, these tiny flower looms were made in the 1940's. My first "real" project from my 24" Hideaway Homestead triangle loom is this shawl. I wove nine individual triangles and then joined them together to create a shawl that is roughly 5.5' across. I used my Berocco Colors (herb garden) and came close to using both of my two skeins. At first, the joining of all those edges made me a little uneasy. I'm a novice crocheter, but I found that simply looping one side to the other was easy. The only area I messed up was the junctions of three triangles; those sections got a little bunchy. Once I finished joining all the tris, I used a tapestry needle to weave in the ends. I then had to decide how I wanted to finish the edges, and decided that easy was best. I did a single crochet around the entire edge, but worked in a strand of yarn to give it a little more definition. I've never blocked anything yet that I've made, so I was a little nervous to wash this and block it. Thankfully, it was easy, and it gave the shawl a nice, clean look. I washed it in the bathtub with a tablespoon of Ecover wash for delicates, and then I rolled it in a towel to get most of the moisture out of it. I then put a blanket and towel down on my bed and pinned it into place. It dried very quickly, within a few hours, and now I own a pretty shawl. Coming soon: pictures of the finished shawl! …and look what he left for me! It's a two foot triangle loom from Hideaway Homestead. A few weeks back, I knew I'd end up with a triangle loom, but just like I always do, I decided to try to make one myself, even after the mess I made trying to create a 4" square loom. This time, though, I decided I'd try it with cardboard. It doesn't cost a thing, and believe it or not, talented people can actually make looms out of cardboard and then create lovely shawls with them. I'm a not one of those talented people. My loom looked okay, but I didn't have any pins so I decided to cut notches on the top, or the hypotenouse. Believe it or not, this worked, but it made the weaving so slow that after a few hours, I gave up, and followed the sage advice my dear husband had given me after he stopped laughing when I showed him my failed 4" square loom… "Leave it to the professionals." So, I emailed Hideaway Homestead, an off-the-grid loom maker from Arizona, on Friday evening, ordering their 24" loom from Etsy. And guess what? I was opening the box on Tuesday morning! Hooray! My loom is lovely. The pins are straight and the oak is smooth. The two foot size is just large enough to weave a triangle in about 30 minutes, plus you don't need an easel. And, just like the 4" Hazel Rose Multiloom, I find I can do one short project and then turn around and begin another right after. There's no setting-aside-to-finish-later-which-turns-into-a-year-later syndrome, if you follow me. Last night, I finished two test triangles, one in an older Yarn Bee blue I had lying around, the other in Lion Brand Homespun. If these had fringes, they'd make cute shawls for dolls. Because the loom was so economically priced, I was also able to saunter into my favorite yarn store and purchased $20 of stunning yarn, Berroco Peruvia Colors in Herb Garden. My plan is to weave about nine tris and stitch them together for a shawl. I'll then felt it a little, but I'm going to do a test one first to see how much it'll felt. I finished this hat a few weeks ago–on election night, in fact. Since this was my first finished Weave-it (Weavette, Wonder Weave) pattern, I'm going to cut myself some slack. Also, I was listening to election results while I sewed it up, so that may help explain why I misjudged the need to stitch the rim of the hat correctly. I was so excited about the election! Plus, stitching all those little squares together is very tiring. As a result, the rim/hem of this hat isn't matched up very well. It's a little bit crooked. Nonetheless, this is a very cool retro hat. It looks good on people who wear cool, retro hairstyles, like a Louise Brooks bob. It doesn't look very good on me, but that's beside the point. Who cares! I made my first real Weave-it pattern! ..and it's a real good thing the cats were there to keep the squares on the table. Those little squares have a way of flying off the table at the oddest times. But not with these cats on duty. When I saw this posting and instructions on the eLoomanator's blog, I knew I had to try to make these two dolls using just one 4" woven square apiece. Barbara Giguere created these dolls using her 4" Weave-it loom. I made mine with the Wonder Weave, which also creates a 4" square. I selected three colors of Dale of Norway/Falk 100% wool and threaded the loom with the neutral beige. I used the same color to weave six rows for the head. I then swapped to my second color, wove six more rows, and finally swapped to my third color, weaving six more rows. Once off the loom, it's pretty straightforward to finish the dolls. Simply sew up the back to make a tube, use the extra yarn to draw in the neck and stuff, then gather the top. Stuff the body, tighten the waist and sew the feet. I liked how Barbara stitched in some arms and on the boy doll, some legs, so I followed the same idea. Doll hair is still difficult for me. I don't quite know how to stitch it so it covers the head and yet can't be pulled off by a child. These two dolls have hair, but it's pretty loose–one good tug and it'll come off. I'll need to research hair for future dolls. These two dolls are just four inches high. Aren't they sweet? After a disastrous attempt at making a 4″ loom on my own using a tiny picture frame and a whole lot of glue and nails (maybe, just maybe, I’ll post a photo of someday if I’m brave enough), I decided to leave the construction to the pros and I purchased a Hazel Rose Multi-Loom. I bought the 4″ size so I could follow Weave-it patterns. An added bonus is that you are able to use three different weaving styles to create your square. I wanted to get an original Weave-it, but found that everyone else seems to want them, too. When one pops up on ebay, it’s certain to sell for a decent sum so after watching a few sales, I set aside that idea. I don’t like bidding. I’d rather purchase something outright, even if it’s a few dollars more. The truth is, I already have a 4″ loom–the Wonder Weave! I love using my vintage Wonder Weave. I can make a square in 15 minutes, but it’s an old loom, and 40+ year old plastic makes little creaky noises that make me nervous. One “snap” and it’s all over for the Wonder Weave. This led me to purchasing the Hazel Rose loom. They come in all shapes and sizes, BTW, and they’re quick to deliver! My order was placed on a Sunday, and I picked up my loom in the mail just seven days later. So far, I’ve only woven four squares on my Hazel Rose loom, two the “normal” way where you wrap three sides and weave the fourth, like the Weave-it, and two using the diagonal continuous weave method. I like both ways because they give two distinct looks. This picture is of me weaving my first diagonal square, using sock yarn so I can follow what’s happening. 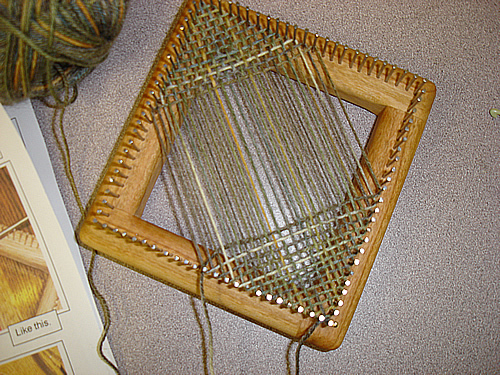 I found a great small loom at a thrift shop–the Wonder Weave! It came with instructions, two books of patterns (copyright 1964), a needle, and a finished square someone attempted, maybe 40 years ago. 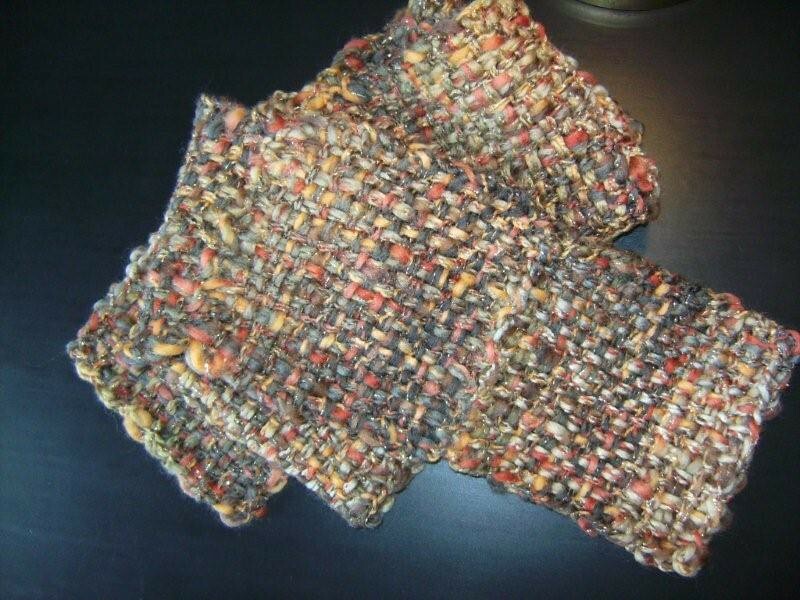 The Wonder Weave makes 4″ squares or 2″x4″ oblongs. I’ve had it two days, and I’m only three squares shy of making that hat I wrote about last time. Because it’s fairly hard to get a 4″x4″ loom (they were popular in the 1930s and ’40s) unless you’re willing to bid on ebay, I decided to start off cheaply by buying a potholder loom from Wal-mart. You remember these guys. We all probably tried to make potholders with those nylon loops when we were children. But, instead of using the loops that came with my $5 plastic loom, I followed the tutorial by Noreen Crone-Findlay that is posted on Youtube (part 1 and part 2). Making one square takes about 15 minutes. I chose some Moda Dea yarn, wove about ten squares, and then sewed them together. I highly suggest reading up on sewing techniques because I didn’t, and my seams are a little clunky. Oh well, live and learn. The result is a pretty nifty scarf, if I do say so myself.